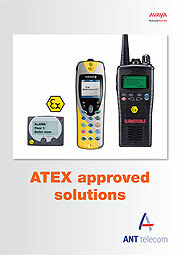 To download your ATEX Approved Solutions information pack please complete the following details. If you experience any problems please call 01494 833100. Supplying us with your details means that we can keep you up to date with all the latest product news and developments. We will not pass this information on to anybody outside of ANT Telecommunications Limited.